Hundreds of Professional and Real Bearded Santas, plus almost an equal number of Mrs. Claus and Holiday Entertainers will take part in the “Parade of Red Suits,” enjoy the competitions of “SNO-lympics” and “The UN-Run” and celebrate the induction ceremonies of the “Santa Claus Hall of Fame,” during the week of July 6-10 during “DISCOVER SANTA 2016,” the world’s largest Santa Claus Convention, aka: "The Kringle Family Reunion." 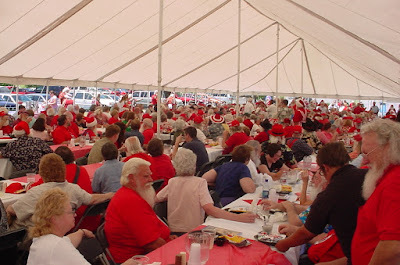 The celebrations begin July 6th, 2016 as the Santas arrive in Branson. At noon, they will attempt a worlds record, of the “Most Kringles on a Ferris Wheel,” when 240 board “The Branson Ferris Wheel,” the city’s newest attraction located at the Track Family Fun Park on Highway 76. Towering at over 150 feet, the Santas will have one of the finest views of the City and the beauty of the Ozarks. The following morning, Thursday, July 7th, 2016 will be the big event of the week, “THE PARADE OF RED SUITS!” It has been ten years and the site is now the Beautiful Branson Landing, which is also celebrating its tenth anniversary. In full Holiday attire, the Parade of Santas and Mrs. Claus will kick off with a U.S. Marine Corps color guard, recognizing the conventions official Charity. Parade spectators will also enjoy floats, vehicles, local officials and celebrities including the famous, “Harlem Globetrotters!” from “Silver Dollar City's Star Spangled Summer"
And while the teams and individual competitors enjoy their games, other Santas, Mrs. Claus and spectators will take part in “The UN-Run!” It’s a 10K race that you do not run. Participants making a donation to Toys for Tots are checked in by “Race” officials, receive a beautiful t-shirt featuring the “Un-Run’ logo, and then sit in a VIP Paddock to view the “SNO-lympics” while enjoying complimentary beverages. Saturday Evening, July 9th, 2016, will see a special Fashion show, “Meet the Kringles,” Followed by The Red Suit Gala a special Dinner and show, where “Red is the New Black!” The evening is sponsored by WorldWide Photography. 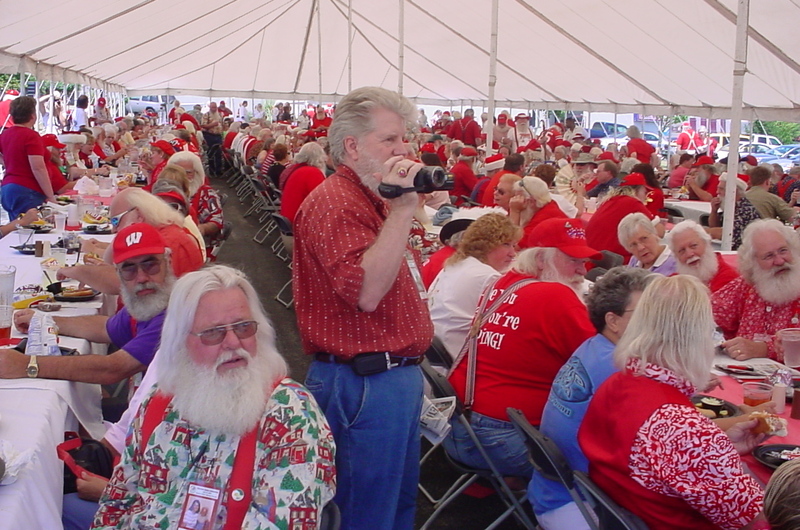 The Special finish to the convention is a celebration, as the Santas honor their own at the induction ceremonies of The International Santa Claus Hall of Fame. This year they are honoring their newest inductees: Professor Tribini of Dresbakken, Denmark; renown actor and motion picture Santa Claus, Ed Asner; Pat Koch of Holiday World in Santa Claus, Indiana, and Santa Tom Hartsfield of Des Moines, IA, originator of the modern day Santa Associations. Santas and Mrs. Claus will close the convention with the Mrs. Claus Pledge, the Knights of St. Nicholas Ceremonies and the reciting of the Santa Claus Oath. Arriving from all 50 States, plus Europe, Asia and Australia, everyone is celebrating the tenth anniversary of the original Discover Santa Convention. (Originally held in Branson Missouri in July of 2006). Added to these activities will be dinner shows at the Dixie Stampede and the Showboat Branson Belle. The main portions of the convention will take place at the Chateau on the Lake, in Branson. Additional lodging will be hosted at the Radisson Branson, Lodge of the Ozarks and the Stone Castle Hotel, all in Branson. Full details and agenda can be found on the convention web site at DiscoverSanta2016.com. 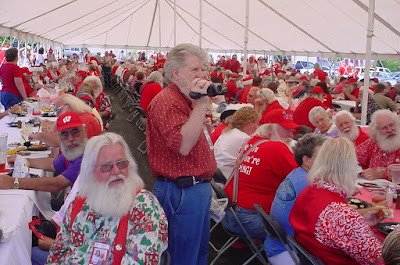 I had no idea that there was a Santa Claus convention in Bransons. I think I would enjoy watching all the different Santas and Mrs. Clauses.